The picture above shows a 10x10 square made from the 20 one-sided notched P-pentominoes with one notch. 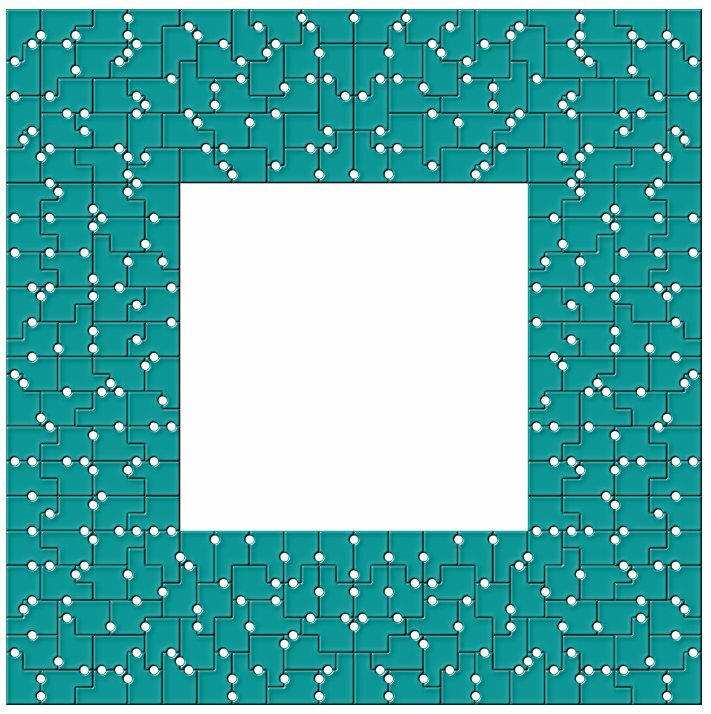 You can also get a 10x10 square, if you take the 10 two-sided pieces and construct a 5x10 rectangle with notches at one long side. Then you have to reflect your solution, but the axis of symmetry is a fault line in the picture. The pieces were cut from white hard foam board with transparent labels attached. The 10 two-sided P-pentominoes with one notch have a total area of 50, but an exhaustive search showed, that a 5x10 rectangle with straight borders can't be constructed. If notches at one side are allowed you can get a solution. 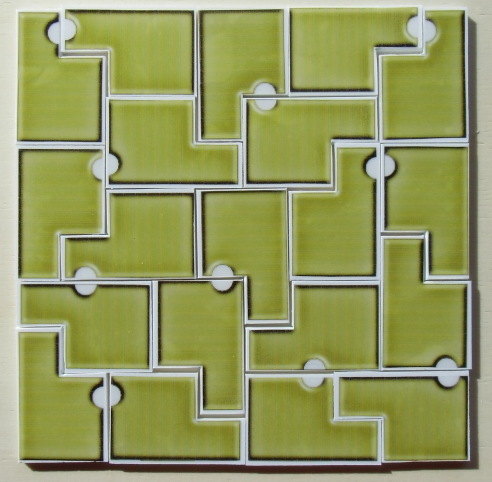 The 45 P-pentominoes with 2 notches can cover a 15x15 square and a 9x25 rectangle. A 5x45 rectangle can't be tiled by P-pentominoes like all 5xn rectangleas with n odd. Joining all P-pentominoes with no, one or two notches we get 56 pieces with a total area of 280. A construction with square symmetry is the 17²-3² square ring. Combining two 5x28 rectangles or two 7x20 rectangles we have solutions for rectangles of size 5x56, 7x40, 19x28 and 14x20. The set of the 120 P-pentominoes with 3 notches is rather difficult to work with, because the differences between the tileabilty of the pieces are small. I had to divide the rectangles in parts with smaller height to ease the search. First I preset notches at the separating lines, but this restricted the search in the first part too much. Therefore I changed the program to allow any notches at the separating line of the first part. Two rectangles of size 15x20 can be combines to get the solutions for the 15x50 and the 30x20 rectangles. The solutions for the 8x75, 10x60, 12x50 and 24x25 rectangles are here. The square ring of size 25²-5² was split into a U-like part and a 25x10 rectangle. 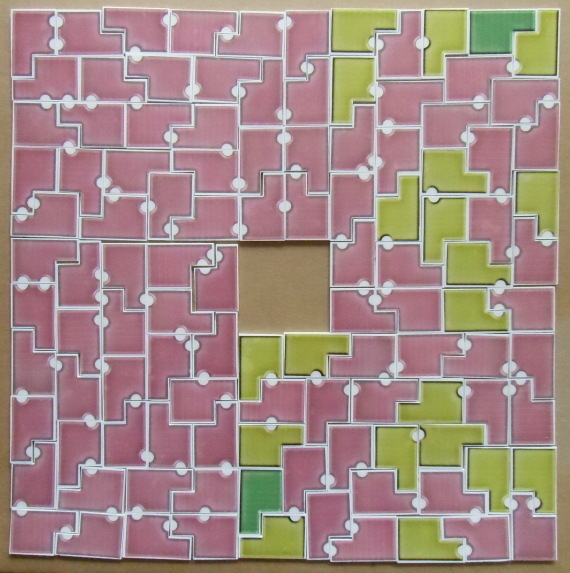 There are 20 one-sided P-pntominoes with one notch and a 10x10 square with these pieces is already shown in the title. You can easily get the 5x20 rectangle, when you reflect a 5x10 rectangle made from two-sided pieces with notches at the small side. The pieces shown in the picture were printed on magnetic foil. Since the P-pentomino isn't symmetric for each two-sided piece there are two one-sided pieces and we get 90 pieces with two notches. Working with the one-sided pieces seems to be very hard and it's a good idea to reflect a construction for half of a given figure using two-sided pieces. This way rectangles of size 9x50, 15x30 and 18x25 can be derived from rectangles of size 9x25 and 15x15, which are shown for two-sided pieces. Fot the 10x45 rectangle another method is needed, since a 5x45 rectangle can't be solved at all. The picture shows the two parts, that were reflected and the final solution. 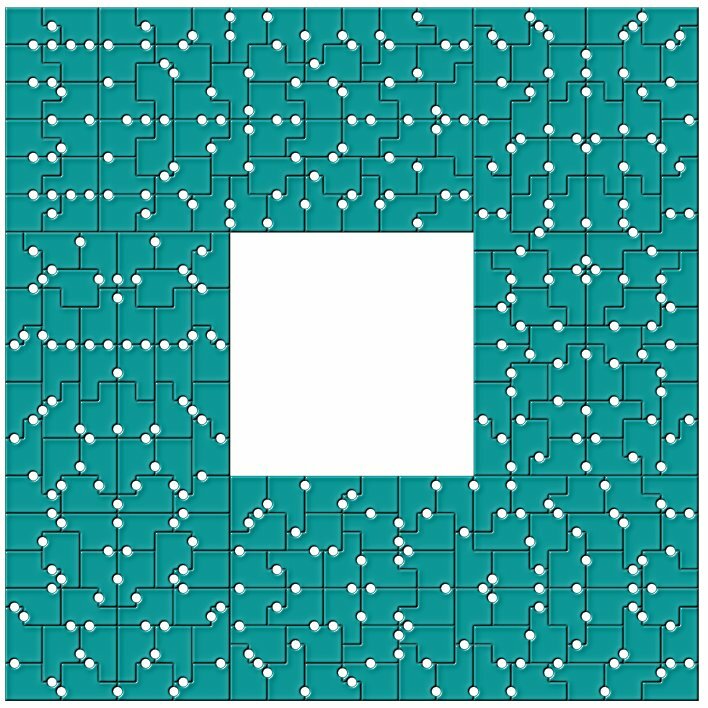 There are 112 one_sided P-pentominoes with up to 2 notches. Constructions are made by using rectangles covered by two-sided pieces and their reflections. 7x80, 14x40,27²-13² covered by two 7x20 rectangles plus their reflections. For the 24²-4² square ring we can use two 14x10 rectangle not yet shown and their reflections. 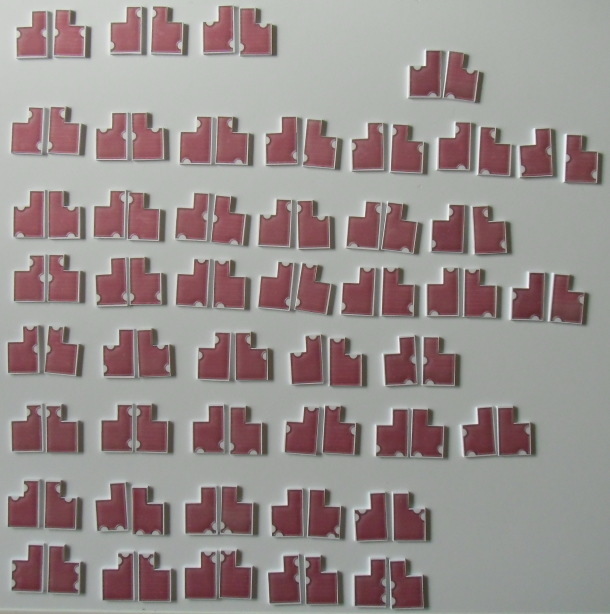 There are 240 one-sided P-pentominoes with three notches giving a total area of 1200. Using the two 15x20 rectangles made from two-sided pieces and their reflections we can get 15x80, 20x60 and 30x40 rectangles or a square ring of size 35²-5². For th 40²-20² square ring I constructed two L-tromino shaped figures with the two-sided pieces and mirrored the solutions. To get the 37²- 13² square ring I tried to contruct two 12x25 rectangles with the two-sided pieces. This method wasn't optimal. The computer worked and worked, but a solution didn't pop up. Me stupid! Four rectangles of size 6x25 with one long side unconstrained can also be reflected and the solution was a matter of seconds.